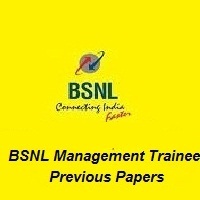 Are you looking for BSNL Management Trainee Previous Papers PDF? Candidates who are seeking for BSNL Management Trainee Sample Papers PDF can find on our webpage. We the team of freshers now have given you the permission to access the BSNL Management Trainee Model Papers PDF at free of cost. Moreover, the Bharat Sanchar Nigam Limited (बीएसएनएल) officials are planning to conduct the written test on 17th March 2019. In this webpage, we have also furnished you the complete information regarding bdnl.co.in Management Trainee Exam Pattern and a different level for the BSNL Selection Procedure for the applied candidates. From the download Links mentioned in the below section of this article, you can utilize the material for the better result in the written examination. On this page, aspirants can also download the BSNL Sample Papers PDF for every subject through the links provided in the below section on this webpage. Surely practicing these BSNL Previous Question Papers will help in qualifying the written examination conducted by the Bharat Sanchar Nigam Limited (BSNL) for the post of the Management Trainee. So, don’t waste your time in searching for the BSNL Management Trainee Previous Papers PDF download from our website and keep on practicing the BSNL Management Trainee Sample Papers PDF as it is ahead for the examination. Furthermore, everyone can download BSNL Management Trainee Previous Question Papers by just clicking the given link to open a PDF file and download for free of cost. Candidates can make themselves improve in performance by finding the mistakes and have a chance to rectify them by comparing with the solutions for avoiding confusion at the time of official Written Examination commencement day. The question paper will be the objective type which only includes the multiple choice questions. Candidates can answer all the questions because there is no negative marking for any question. The Examination pattern and syllabus and the time duration for the written test are mentioned as per the details in the below tabular format. BSNL Management Trainee selection process will be like the candidates who have applied and received the hall tickets are allowed into the exam center for the online examination. Aspirants who cleared the written test based on the merit list are only allowed for the Group Discussion round. While the process of Document Verification every candidate should carry his/ her own original document proof for the purpose of security. At the final stage, contenders will have a personal interview. The candidates who applied for the बीएसएनएल Recruitment 2019 can check BSNL Management Trainee Previous Papers and the latest updates based on the official announcement of Bharat Sanchar Nigam Limited (BSNL), by frequently visiting our website FreshersNow.Com.